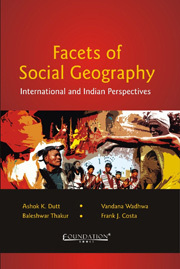 Facets of Social Geography: International and Indian Perspectives provides a breadth of information on the nature, scope, history and evolution of social geography along with a good representation of approaches and techniques used in this field. It discusses both conceptual and empirical approaches, and traditional and emergent social geography themes including art and culture, urbanism and crime, social institutions of caste, class and religion, gender, disability, activism, feminism, social planning, enterprise zones, social and economic inequities, post-colonialism, post-modernism and development of quantitative, qualitative and mixed methods. India's social structure based on centuries-old Karma principles and a four-level caste system are dealt with in this book to help unravel the country's social geography. This book is a felicitation volume in honour of Allen G. Noble, Distinguished Professor Emeritus of Geography and Planning at the University of Akron, Ohio, USA. A result of the collective effort of 40 leading national and international scholars, it is an excellent addition to the current stock of knowledge and will be of interest to geographers, sociologists, demographers, urban and regional planners and policy-makers. Edited by Ashok K. Dutt, Professor Emeritus in Geography, Planning and Urban Studies, University of Akron, USA, Vandana Wadhwa, Lecturer in the Department of Geography and Environment at Boston University, Massachusetts, Baleshwar Thakur, Former Head of the Department of Geography, Delhi School of Economics, University of Delhi,, Frank J. Costa, Professor Emeritus in Geography, Planning, Urban Studies and Public Administration at the University of Akron, USA. I thank the editors of this volume for the opportunity to contribute this essay to honour Dr Allen G. Noble, a cultural geographer, who retired from the University of Akron, Ohio, as Professor Emeritus after a long and distinguished career. I first met Allen at one of the annual conferences of the Association of American Geographers in the early 1970s. The meeting marked the beginning of an enriching professional relationship that has spanned three decades. Land in Delhi is used for a variety of purposes among which residential land use is most important. It accounts for a large part of built-up area of the city with varying patterns of population density and housing quality. Being the largest user of space, residential houses are heterogeneous, immobile, complicated and expensive. The houses are occupied by households belonging to different social and economic classes, depending on their capacity to pay the housing market. Therefore, in Indian cities, the segregation of people into different neighbourhoods on the basis of social characteristics, such as ethnicity, occupation or income is a fairly common feature. The spatial distribution of housing characteristics, the nature of housing markets and the neighbourhood communities within cities have become one of the major research foci of urban social geography (Cadwallader, 1996, p. 241). Over the last three decades, most cities in India, including Delhi, have experienced residential and social polarization in the built-environment and social space resulting into slums and squatter settlements and highstatus residential areas. The net result has been massive inequality and increasing intolerance. Our cities are becoming more divided, increasingly segregated and differentiated across the lines of race, ethnicity, gender, sexuality, ability, class and power (Del Casino, 2009, p. 1). Social geographers are interested in these issues because they deal with organization and contestation of space (Del Casino, 2009, p. 2). ‘Literature represents a source of geographical data and perceptions that are mostly untapped by geographers. Among Indian writers of fiction in both English and Hindi, the city of Delhi, the capital of India, is ‘an idea with physical boundaries.’ Both Hindu and Muslim authors regard the capital city with mixed emotions of reverence and resentment. The urban environment of Delhi presents sharply contrasting images of security, retreat, familiarity, noise, crowds and filth. Authors carefully describe both the city's physical frame and the quality of its communal life. This essay is intended to examine the ‘idea’ of Old Delhi (Shahjahanabad, the walled city) in its contrasting facets across the writings of representative Indian authors. Old Delhi has been a living city since the seventeenth century and forms a part of the much larger Delhi Metropolitan Area. The crowded world of Old Delhi is vividly portrayed in numerous novels and short stories including Jhabvala's The Householder (1960), Yadav's Andekhe Anjan Pul (‘Unseen, Unknown Bridges’) (1963), Ali's Twilight in Delhi (1966), Rakesh's Lingering Shadows (1970), Chopra's Jaren (‘The Roots’) (1972), Vaid's A Blind Alley (1972), Bista's Beete Din (‘Bygone Days’) (1974), Nahal's My True Faces (1978), and many others. The city of Old Delhi, which now spreads even beyond the old walls of Shahjahanabad, mainly towards its west and northwest with the traditional settlement pattern, was developed largely after the Revolt of 1857. India is a land characterized by “unity in diversity” amidst a multicultural society. This is symbolized by variety in culture such as different languages, religions, castes, house types, dance forms and dietary patterns (Noble and Dutt, 1982). Of these cultural traits, language is an important instrument of cultural identity since it is through this medium that different groups of people communicate with the world and express a sense of identity to a place. Often, social tensions emerge when a certain segment of society feels ostracized from social and economic processes of development due to lack of knowledge of the dominant and prevalent language. This often leads to granting linguistic minorities special privileges to accommodate them in the process of mainstream national social and economic development. India is considered to be the world's most linguistically diverse nation. The Eighth Schedule of the Constitution specified 14 major languages and a concerted effort has been made to fully develop all these languages in the interest of national integration and development. Subsequently, eight more languages were included in the schedule and these were: Sindhi (1969), Konkani, Manipuri and Nepali (1993), Bodo, Dogri, Maithili and Santhali (2003) (Sengupta, 2009). According to the 2001 Indian Census approximately 96.6 percent of the Indian population spoke these 22 scheduled languages with another 100 non-scheduled languages spoken by a minimum of 10,000 people in different regions (Census of India, 2001). The status of any population in a society is intimately connected with its economic position, which itself depends upon rights, roles and opportunities for participation in economic activities (Government of India, 1974, p. 148). Therefore, in addition to education, employment should also be considered as a variable measuring the status of women. Equal opportunity for economic participation is or should be the right of all men and women because discrimination against women is incompatible with human dignity and the welfare of the family and of society (United Nations, 1967). The Constitution of India pledges equality of status and opportunity, justice, social, economic, political, and dignity of the individual to men and women equally. Despite the assurance of equal opportunity in employment, in reality women have less access to employment in services. The disparity in employment ratio is considered often attributed to the lower level of education of women. Moreover, in a patriarchal society these disparities are largely the result of several other factors, such as attitude of men towards women's role and employment, discrimination perceived by women in selection and promotion as well as due to their household duties and child care. A committee on the status of women in India stated that the ‘image of Indian women is created by a few women holding high position or academic qualification’, which serves to conceal rather than reveal the reality of the low status and educational levels of the average Indian woman (Government of India, 1974). The world has seen, and is still seeing the rapid development and spread of urban areas. Cities and towns have sprouted up every where around the globe. Villages are transforming into towns and towns into cities, attracting more and more people, and adding to urban expansion. Population increase and industrialization are the key factor behind such a phenomenal change in spatial structure. India, the second most populated country in the world, has experienced large-scale development in and around its urban areas. The city of Kolkata (formerly Calcutta until 2001) in eastern India, the focus herein, has being aggressively multiplying in size over the last three decades. However, the rea population explosion took place between 1940 and 1950, during the Indian independence phase, although growth as such is still continuing (Chakraborty, 1990). Closely associated with the morphology of any city are its past and present populations that have adhered to certain social and economic customs and followed distinctive occupations (Dutt et al., 1989, 151) Kolkata was the first major city developed by the British East India Company in the early 1700s. The East India Company built their first fortified construction, Fort William, to protect them from the other colonia aspirants. It was around this same fortified structure that the city of Kolkata grew and nurtured itself. It was a garrison town first, then the Company's town, next a provincial city, and later the headquarters of the British India government (National Atlas and Thematic Mapping Organisation (NATMO), 1996). Rural India, consisting of 72 per cent of the Indian population, is different from the urban segment of the country. The Indian village plays a very significant role in the progress of the whole nation; it is a source of art, culture, literature, religion, human values, philosophy, economic wealth and agricultural produce. It is also a storehouse of abundant human resources, though the majority of these resources are underdeveloped, undeveloped, unused, underused and overused, as well as inefficient and poor in quality. Rural India is also characterized by the presence of high birth, death, and infant mortality rates, low life expectancy, malnutrition, hunger, illiteracy, ignorance, unemployment, poverty, poor sanitation and housing conditions, water scarcity and many such stubborn problems of human resource development. Human resource development is a continuous process of promoting quality of life for all people of an area. According to Gupta (1998), human resource development is the complete physical and mental growth of individuals. Rao (1999) emphasizes the importance of human resource development and states that it involves getting the right kind of people, creating a culture that nurtures and retains talent, providing avenues for competence development at all levels, ensuring utilization of talent and aiding in the renewal of various productive human processes. Nadler (1994) defined human resource development as a planned continuous effort by management to improve employee capacity levels and organizational performance through training, education and development programmes. In the social environment of rigid hierarchy, the performing arts of India served to bridge the gap between the intellectual Sanskritic tradition and the popular folk tradition. Ancient Brahminic tradition forbade Sanskrit learning to the non-initiates, that is all those who were not ‘twiceborn’. This restriction applied to all women generally, including those from the brahmin caste. Although the so-called ‘high tradition’ kept its doors closed against intellectual pursuits by common people, the latter enjoyed some measure of spiritual experience through theatre, dance, folklore, oral literature and other aesthetic media. The most respected scripture of dance and drama, the Natyasastra, written by the Sanskritic scholar, Bharata, is so fundamental that it has become known as the fifth Veda. Dancing, like other arts, became recognized as a spiritual experience. In fact, the performing arts provide a source of religious education to the common people, as well as serve as channels for mass communication of moral and ethical values, gained through commonly shared aesthetic experience. The dance theatre of India represents a blending of ‘high’ and ‘folk’ traditions. All classical schools of Indian dance rely on the textual foundation of the scriptures, either of Bharata or of Sanskritic scholars. Dance gurus often refer to these texts in order to defend and protect their art. In fact, the very word ‘classical’ has some prestige attached to it, inasmuch as it signifies closeness to the ‘high’ tradition. The field of social geography is inherent to the study of societies, their way of life, customs and traditions. The historical dispersal of social geography has undergone change through many different stages due to new scientific development. Explorations of various time periods had great bearing on the exposition of routes, civilizations, and economics of lands and people, which brought the societies to limelight and established contemporary trends. In geography, the contributions of Vidal de la Blache (1845–1918) paved a distinctive role to relate the qualities of environment to societies, and Jean Brunhes (1869–1930) emphasized the assessment of communities by their background and economic resources. The contributions of de la Blache and Brunhes, along with those who followed their lead, initiated a particular study of causative social geography throughout the world. Their studies were actually related to human adjustments to climate, physical bases, transports, economic activities, houses, dwellings and cultivation of environment. Before World War II, the scope and objectives in the study of social geography were confined to physical geographic influences on human societies. As far as the American and the European views on the structure of social geography are concerned, the ideas of Hartshorne and Houston respectively are the most characteristic and parallel in alignment as noted below. Their ideas, in a way, satisfied universal appeal. Thus, this chapter is centred on these parameters with reference to important literature on their subject. With a few notable exceptions, cultural geographers have neglected the study of one of the most comprehensive spheres of human activity – vernacular or folk art, which embodies a complete record of man's life, work and experience. For both its materials and techniques, folk art depends on the character of a place as it expresses the physical and cultural environment as well as the distinctive mental perceptions of the people. As manifestation of human experience and aspirations, folk art is woven from the values and general patterns of life and culture of the people and as such, forms an aesthetic canvas that portrays the interactive elements of regional character. The geography of art attempts to study various art forms as: (a) an expression of a region's physical, socioeconomic and cultural setting, and the people's distinctive values that orient, articulate or explain the culture, and (b) a record of a regional culture, an unerring clue to the life, experience and aspirations of a people. It is not concerned with dates, titles, names and biographies or with the sensuous value of works of art as individual independent objects. Rather it addresses itself to the physical and social conditions of origin and operation of a work of art, to the background of regional economic and cultural factors and forces that condition the forms of art and affect its motifs and themes, and also to its meaning in a given cultural region with all its aspirations, experiences and fulfillments. Nepal is the most densely populated country in the Himalayas, where the population has grown from 5.5 million in 1930 (Zurink and Karan 1999) to 23 million in 2001 (Central Bureau of Statistics (CBS), 2002). Kathmandu Valley is located in a tectonic depression in the central Himalayas over flat lacustrine soils deposition. Geographically situated in the central part of Nepal, Kathmandu is the capital of the country. The Valley has a centripetal flow of rivers and streams originating in the surrounding hills and flowing out to the south from a narrow gorge. Kathmandu is located within the valley of the Bagmati river system, eight tributaries of which drain the city. The river system has always been the city's main source of water for drinking and irrigation and it holds religious, cultural and social value for the Nepalese (Asian Development Bank/International Centre for Integrated Mountain Development, (ICIMOD), 2006). Three local administrative districts – Kathmandu, Lalitpur and Bhaktapur lie in the Katmandu Valley. According to the Local Self-Governance Act 1999 of the Government of Nepal, these districts are further divided into smaller local administrative and development units – one metropolitan city, one municipality and 57 Village Development Committees (VDCs) in Kathmandu district, one submetropolitan city and 41 VDCs in Lalitpur district, and, two municipalities and 16 VDCs in Bhaktapur district. The district boundary in most cases follows the water divide except for a small southern part of Lalitpur district (Fig. 13.1). The Chipko movement is popularly recognized as the most famous and successful environmental movement in India's history. The term ‘chipko’ is commonly translated from Hindi as ‘hug’ or ‘embrace’ and it refers to a method of protest in which one embraces a tree in order to prevent its felling (Right Livelihood Awards (RLA), 1987; Karan, 1994). The contemporary Chipko movement is best known for a string of protests that began in the 1970s, which most prominently involved an increasingly large number of peasant women. The majority of these protests occurred in the Himalayan foothills in the region of Uttarakhand (Fig. 26.1). A majority of the Indian Himalayas lie in this region, which borders both Nepal and Tibetan China. As two of the most heavily forested states in India, Uttarakhand (formerly Uttaranchal) and Uttar Pradesh have long been relied upon for their supplies of natural resources, which have been regarded as critical to national economic development (RLA, 1987). While organized resistance against restrictive and unjust economic devel- opment and environmental policies have occurred elsewhere in India, the materialization and manifestation of the Chipko movement reflects the specific multi-scalar social, political and ecological processes which constituted social life in the late 1960s Uttarakhand, and which was itself later reshaped by these distinctive patterns of struggle. This case study examines Chipko movement activity at the specific regional scale of Uttarakhand in order to examine how social movements emerge from spatially-embedded power relations and social contexts. According to sociologist Len Barton (1996, p. 3), one charge of his field is to relate social structures to the ‘lived reality of people in particular social settings’. If ‘particular social settings’ includes a person's spatial setting, then the same charge is true for social geography. These relationships between social structures and lived realities are particularly meaningful in disability geography – one of the more recent streams of social and human geography. This chapter seeks to introduce the reader to this field, giving a brief glimpse of the evolution and development of disability studies in the larger realm of the social sciences, particularly in geography. As with any other introductory work, it runs the risk of giving the subject superficial treatment by trying to present too much in too short a space. However, since disability geography still does not find adequate representation in mainstream social geography books or curricula, it would be appropriate to provide an overview of the field to the reader. While breadth is prioritized over depth, the latter is not eschewed altogether. Using a phenomenological approach, I have tried to highlight the prominent role of social environments in the creation of disability through a comparative examination of shifting meanings of disability across space. Thus, the two-fold aim of this chapter is to highlight disability and persons with disabilities as important components of society and social geography studies, and to underline the importance of social contexts in the creation of disability. Slums and squatter settlements are an essential facet of the urban landscape of most countries, more so that of the developing countries. They are also somewhat of a paradox in themselves. They are both: (i) a manifestation of urban poverty, and (ii) a reflection of the economic pull of urban areas. The definition of a slum varies from country to country, depending on the cultural mores and economic conditions. Slums are residential areas of least choice, characterized by dilapidated houses, poor ventilation, inadequate lighting, poor sanitation, lack of clean drinking water, overcrowding, convoluted street patterns, fire and flood hazards, poor facilities for education and health, unhygienic living conditions causing air and waterborne diseases. Socially, they are characterized by drug abuse, alcoholism, crime, vandalism, escapism, apathy and social isolation (Haggett et al., 1981; Census of India, 2001). In India, slums have been defined under Section 3 of the Slum Areas (Improvement and Clearance) Act, 1956, as areas where buildings are unfit for human habitation by reason of dilapidation, overcrowding, faulty arrangement and design of such buildings, narrowness or faulty arrangement of streets, lack of ventilation, light, sanitation facilities or any combination of these factors which are detrimental to safety, health and morals.